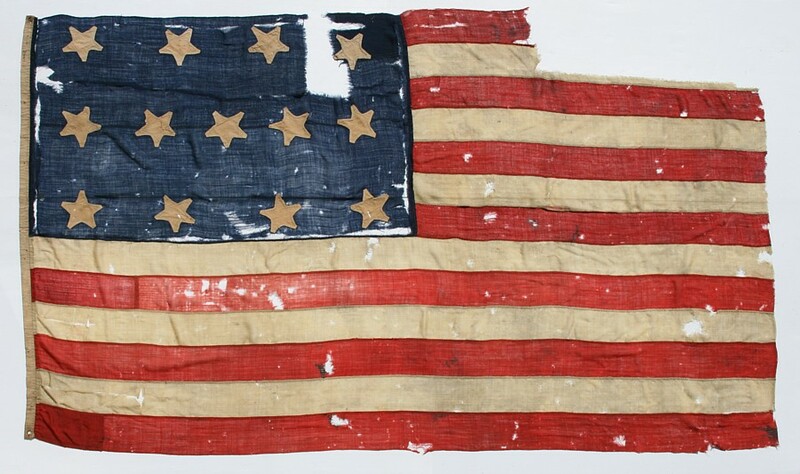 Flag Size (H x L): 69" x 119"
Among surviving antique American flags that date to the 19th century and prior, very few exist that pre-date the Civil War (1861-65). I often cite the number that fall into this bracket as being fewer than one-in-one-hundred. One-in-three-hundred is probably a reasonable estimate. Within this fractional percentage, far fewer pre-date 1840, and of those that actually do, some of these exceptionally rare survivors are simultaneously enormous and graphically plain. Made primarily for ships, they are too big to reasonably frame and display in even the largest of private homes. This 13 star flag was made prior to the 1840 benchmark, is more reasonable in scale and, at the same time, visually compelling. Arranged in the 4-5-4 pattern, the stars have arms that terminate in flattened points. This distinctive profile is shared with some of the earliest of known examples and, according to any number of historical records, the 4-5-4 arrangement would have been seen on a significant number of our nation's eldest flags. Note how the stars point in various directions on their vertical axis, which adds a nice folk quality to this beautiful early textile, as does the uneven spacing created by the justified rows in two different counts. This 4-5-4 pattern flag formerly accompanied the "Easton Flag" at the Easton Public Library in Northumberland County, Pennsylvania. The Easton Flag is one of the most famous early examples that physically exists in present day America. Its imagery was basically a reversal of the Stars & Stripes. Instead of a blue canton with 13 white stars, resting on a field of 13 red and white stripes, the Easton flag has a canton made of 13 red and white stripes, resting on a wide field of solid blue, on which there are 13 stars, arranged in a circular pattern of 12 with a star in the very center. Long rumored to be one of ancestors of the Stars & Stripes, local legend held that the Easton Flag was flown over the courthouse on July 8th of 1776, when the Declaration of Independence was read aloud on the courthouse steps by the county clerk. The Second Continental Congress did not adopt a national flag until almost a year later, on June 14th, 1777. 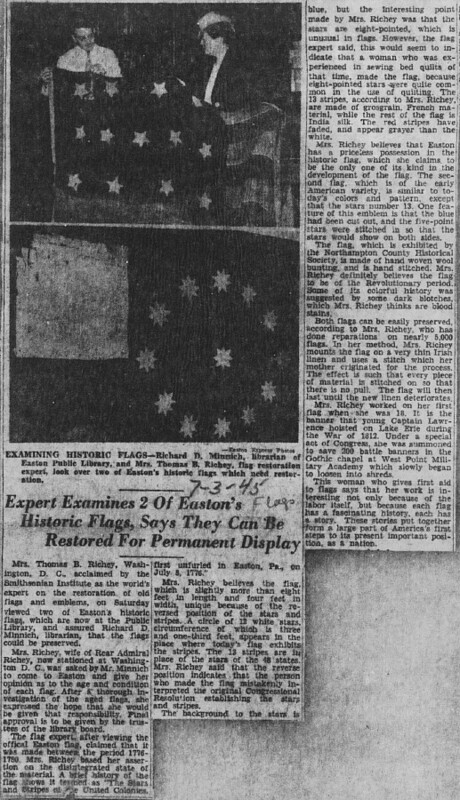 This portion of the history of the Easton flag is disputed as merely myth by most flag historians, because there is no hard evidence that it existed in that period, but the remainder of the flag's story is better documented. On September 6th, 1814, the flag is known to have been presented by the 14-year-old daughter of a man named George Beidleman, to Captain Abraham Horn's local militia unit as they dispatched for service in the War of 1812. At the war's end the Company disbanded and returned home with the flag. In 1816, former members of Horn's Company, joined together with Captain Peter Nungesser's Company of Light Infantry, to form a new militia unit called the Easton Union Guards. 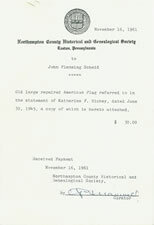 In 1821, the decision was made to deposit the flag with the Easton Library Company for safe keeping in Library Hall on North Second Street, where it remains to this day (though in a new facility). 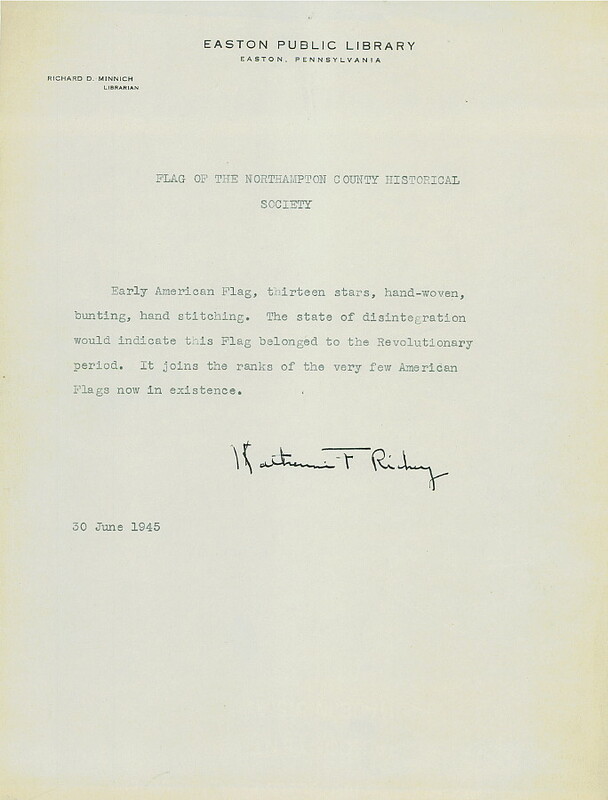 In June or July of 1945, The Easton Public Library contracted with famed flag restorer, Katharine Fowler Richey (1889-1949), who claimed to have restored more than 5,000 flags and whose mother, Amelia Fowler (1862-1923), was one of ten women who, for eight weeks, performed the conservation on America's most famous surviving flag, the Star Spangled Banner. 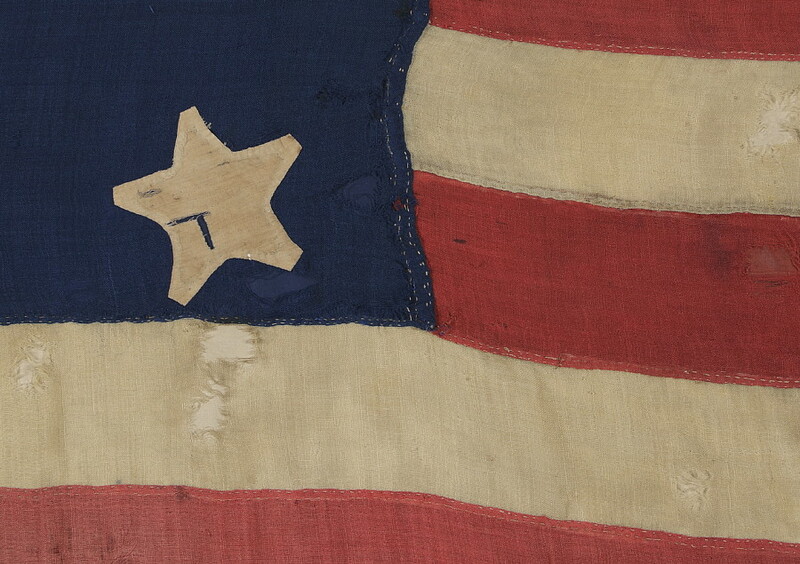 Richey was commissioned to conserve and restore both the Easton Flag and this very early 13 star flag in the 4-5-4 pattern, which was also apparently in the Library's possession. The flag was apparently on loan from the Northampton County Historical & Genealogical Society. The two flags were featured together in a July 3rd, 1945 article for a local newspaper, accompanied by a photo of Richey holding the 4-5-4 pattern flag with the help of librarian Richard D. Minnich. In the article, Richey pronounces both flags to positively date to the 18th century. 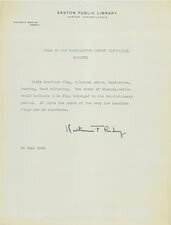 A signed letter from Richey to Minnich, dated June 30, 1945, formerly states her opinion regarding the 4-5-4 example. 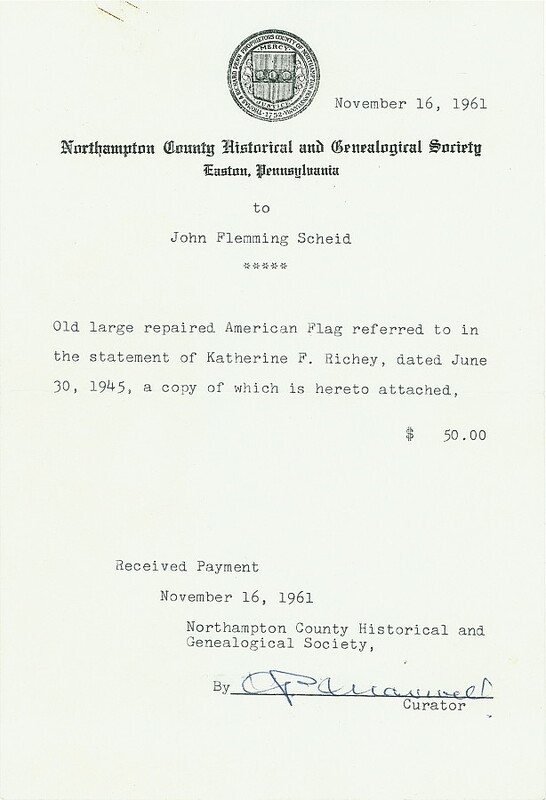 In 1961, the Northampton County Historical & Genealogical Society sold the 13 star, 4-5-4 pattern flag for the sum of $50, to a collector by the name of John Scheid [b. 05/31/17, d. 03/28/97], who had, in 1960, been selected as the first president of the Forks of the Delaware Historical Arms Society. The original receipt survives with the flag, as does the Richey's letter. 36 years later, in 1997, following Scheid's death, a New Jersey collector purchased the flag from the Scheid estate. The flag was taken to the Smithsonian, where it was examined by textile expert Katherine Dirks, who later led the project team that restored the Star Spangled banner. Dirks' formal, one-page report was regrettably lost, and her department at the National Museum of American History has since been closed, but her original, signed, summary letter to the collector survives. It states that "the flag appears to be from the early 19th century, rather than the 18th century", an opinion with which I personally agree. The collector fortunately recalls extensive verbal communication with Dirks, who found that one of the threads used in the construction was not commercially available in the United States until 1812. The thread was commercially available in England before that date. Because it was probably the most recently made fabric used in the construction of the flag, this thread establishes the earliest possible date that the flag could have been made. The stars are made of cotton, hand-sewn, and single-appliqued. 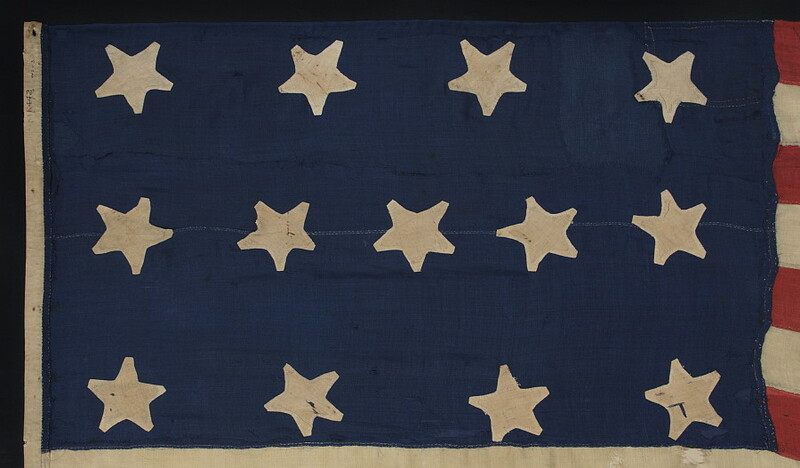 This means that they were applied to one side of the canton, then the blue fabric was cut from behind each star, folded over and under-hemmed, so that one appliqued star could be viewed on both sides of the flag. This was a common method of applying the stars during this period. The canton and stripes of the flag are constructed of wool bunting with a coarse, homespun weave and with significant irregularity in the width of the strands. The wool is an early variety, with the appropriate characteristics that I have found to be indicative of the period between approximately 1820 and 1840, though it could be slightly earlier. The canton is made up of two laterally joined, 18-inch wide lengths of fabric. 18 inches is a standard loom width for wool bunting made throughout the 19th century and prior. The hand-sewn hoist binding is made of sailcloth canvas. At the top and bottom of this are hand-sewn, whip-stitched grommets. The word "Armory" was written along the obverse of the hoist with a dip pen, near the bottom, in a 19th century hand. Although the flag is very small in size for garrison use, it may have been sufficient for a small barracks or it may have served as one of several flags in the stores at an armory, available for whatever use the ranking officer intended. It may also have seen use at sea and was afterwards put into storage. 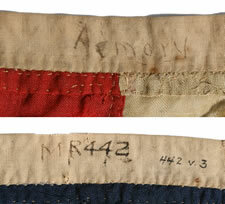 Whatever the case may be, the flag experienced losses at the fly end and was clearly flown for an extended period. It was longer originally, yet because there were no official proportions for the American national flag until the 20th century, its original length cannot be not known with certainty. What is known is that American flags were often made in an elongated format for use on ships, so that they could be folded back and hemmed as they experienced loss from wind damage. At the top of the hoist, two groups of numbers are written in a more modern hand. These are inventory codes and were probably used at the Easton Public Library or the Historical Society. The U.S. Navy used the 13 star count on small boats, not only in the 18th century, but throughout much or all of the 19th century, particularly the second half. Ship captains were paranoid about the ability of foreign ships to recognize the flag on the open seas. On smaller scale flags [most of which seem rather huge in today's world], the ability discern individual stars at a distance, through a spyglass, was a serious concern. Keeping the count at 13 for the flags used on maintained better visibility. In my experience, the use of 13 stars for small naval flags during this early period was not consistent and the same seems to have been true for at least some flags used on land. Some documented examples survive that have the full complement of stars and some have 13. The use of 13 became more consistent by the military at sea as time passed. The practice theoretically ended in 1916, following an executive order from then-President Woodrow Wilson, though old military traditions die hard and, according to the late Smithsonian flag expert Grace Rogers Cooper, Wilson's order did not completely dispel the presence of 13 star flags on U.S. Navy craft. Two thirds of the top two stripes of the flag were purposely cut from the fly end. This is clear evidence of "souveniring," a practice carried out by military men following a either significant term of service or a notable engagement. Pieces of the flag were thus clipped and taken home as mementos. The July 3rd, 1945 newspaper article states that restorer Katharine Richey felt that the "dark brown splotches" were blood. Although these have not been tested, Richey by this time reports to have conserved almost 5,000 flags, including 200 for the Gothic Chapel at West Point and many for the State of Pennsylvania. 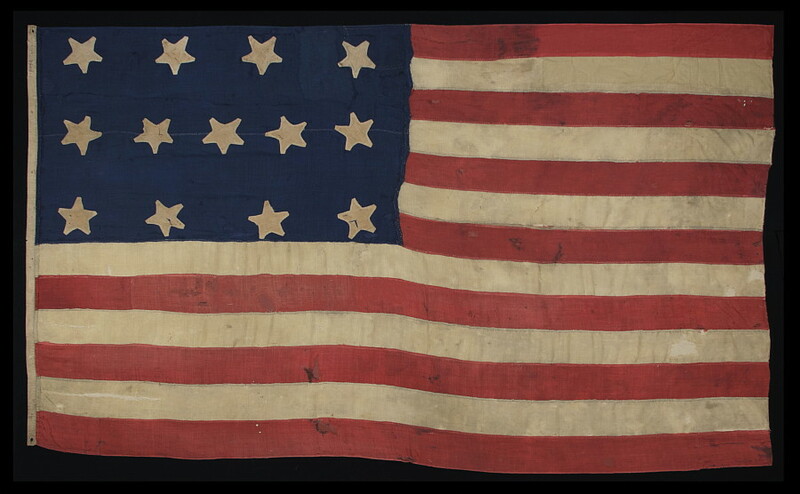 In summary, this exceptional 13 star flag, dating to the period between 1820 and the 1830's, and potentially earlier, is a steadfast survivor among the oldest known American national flags. 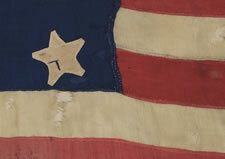 With an interesting, documented history in its association with Easton, Pennsylvania and the Easton Flag, and one of the most interesting personalities in the preservation and study of historic flags, it has great folk qualities in its squared-off stars that point in various directions an in its handmade construction with a much-worn appearance. Together these factors constitute a fantastic early 19th century example. 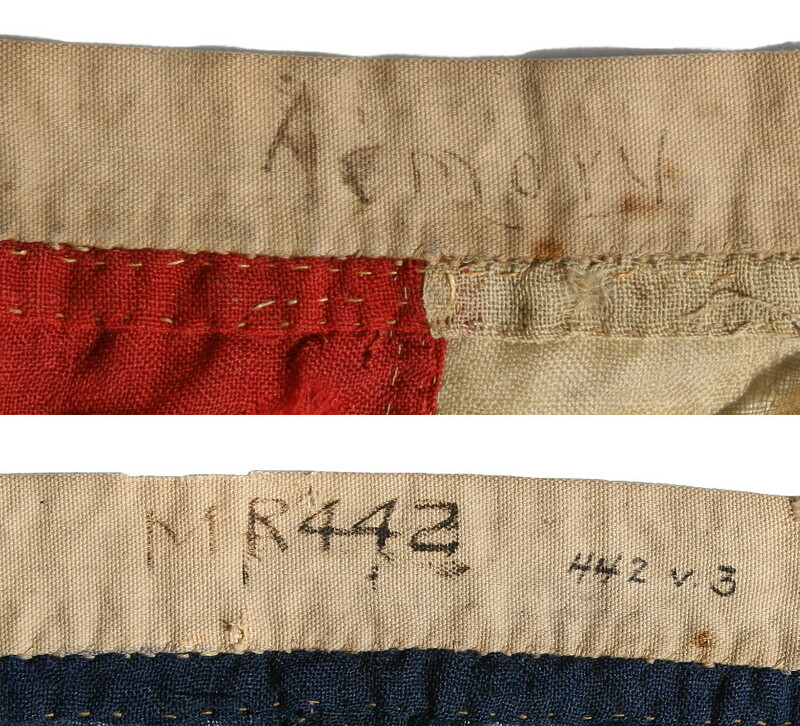 Condition: In addition to the above notes on souveniring and possible blood stains, there are significant tears and losses throughout, and the binding stitches at the fly end are absent, all of which serve as evidence that the flag experienced natural loss during its course of use. Fabrics of similar coloration were placed behind all of the above affected areas during the mounting process. The foxing and staining throughout is expected. Many of my clients prefer flags to show their age and history of use. Further, the great rarity of 1840 and prior examples warrants most any condition. Mounting & Conservation: Katharine Richey's method of flag preservation, devised by her mother, would have been a destructive process to this flag if it were not made of sound materials and if we had not removed her work. We removed thousands of stitches and her linen backing. The Smithsonian undertook the same task with the Star Spangled Banner. Following the reversal of Richey's work, the flag was hand-stitched to 100% silk taffeta for support throughout the seams and the star field. It was then hand-stitched to 100% cotton, black in color, which was washed to reduce excess dye. An acid-free agent was added to the wash and the fabric was heat-treated for the same purpose. This process has prepared the flag for framing.